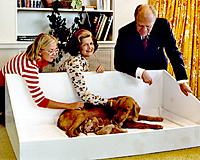 Note: Additional photographs of Mrs. Ford appear in the Betty Ford media kit. Description: First Lady Betty Ford, unaware of Sara Jane Moore’s assassination attempt, greets President Ford inside Air Force One, for the trip back to Washington. September 22, 1975. Description: First Lady Betty Ford greets Empress Nagako as she arrives at the White House with Emperor Hirohito of Japan for a state dinner in their honor on their historic first visit to the United States. October 2, 1975. Description:First Lady Betty Ford and her pet golden retriever, Liberty, watch over Liberty’s puppies on the South Lawn of the White House. October 5, 1975. Description: President and First Lady Betty Ford pause on the dance floor at a White House state dinner in honor of Egyptian President and Mrs. Anwar Sadat. October 27, 1975. Description: President and Mrs. Gerald R. Ford and daughter Susan play with Liberty’s golden retriever puppies on the South Lawn of the White House. November 5, 1975. Description: Having selected “handmade and folksy” as the theme for Christmas at the White House, First Lady Betty Ford makes homemade ornaments with daughter Susan for the tree in the third floor Solarium during a photo-op for Parade Magazine. November 10, 1975. Description:Co-producer Ed Weinberger coaches First Lady Betty Ford and Mary Tyler Moore during the filming of a Mary Tyler Moore Show episode in which Mrs. Ford played herself. Hay-Adams Hotel, Washington, D.C. CBS television aired the episode on January 10, 1976. November 17, 1975.